Issued privately in CD form with Cat. No. CAT2. Availability: In WORD2000 format on one CD. From the compiler, 20 Sherwood Grove, York, YO26 5RD, U.K. Working File CDs currently available. MAT101 Early Matrix Series, 1898-1904. MAT102 Fred Gaisberg’s a, b and c series, 1901-1919. MAT103 Will Gaisberg’s d, e and f series, 1903-1921. MAT104 William Sinkler Darby’s g, h and i/j series, 1901-1909. MAT105 Franz Hampe's k, l and m series, 1902 to 1916+. MAT106 Walcutt, Scheuplein, Dilnut & Smoot, n o and p series, 1902 to 1916. MAT107 Max Hampe’s q r and s series, 1904 to c.1915. MAT108 Charles Scheuplein's t, u and v series, 1902-1920 / Harry Fleming, 1920-1921. MAT109 Arthur Clarke's x, y and z series, 1908-1915. MAT110 Ivor Holmes & William Hancox ab and ac series, 1908-1914. MAT111 Edmund J Pearse ae and af series, 1909-1916. MAT113 GeirgeDillnutt ak and al series, 1911-1919. MAT114 William \J Beckwith am and ar series, 1919-1921. MAT115 The London HO “Head Office” Series, 1912-1921, 10” & 12”. MAT201 BA/CA Series - R R Sooy (1921) and F W Rennie (1929). & Bb/Cc Series, London, 1921 to 1930 (various experts). MAT202 BD/CD Series – R E Beckett, 1923-30; India, N Africa, Milan Berlin, Hague, Far East. MAT203 BF/CF Series – E Fowler, 1926-30: Paris, Athens. Constantinople, Italy, Zurich, Solèsmes, N Africa, etc. & BG/CG Series – E D Gower, 1929-30: Athens, Lisbon. Cairo, Paris, N Africa. & BH/CH Series – A S Clarke (none traced). MAT204 BJ/CJ Series, various locations, particularly in Spain, H E Davidson, 1925-1930. & BK/CK Series - G W Dillnutt, 1921-1930, various locations, Europe, North Africa, India. MAT205 BL/CL Series - E Larter, 1924-30: Paris, Berlin, Vienna, Prague, Far East. & BM/CM Series – W J Beckwith, 1921-1930 Italy, Scandinavia, Spain, Vienna, Athens. MAT206 BN/CN Series - S E Tunn, 1928-1930, Lisbon, Oslo, Paris, Berlin, Munich, Beuron, Cologne, Barcelona. & BP/CP Series – J Jackson, 1923-26: Barcelona, Madrid, Paris. MAT207 The London BR/CR matrix series (non-studio recordings), 1925-1930. MAT208 BS/CS Series - H Fleming, 1921-30: Milan, Athens, Spain, Paris, Antwerp. N Africa, Latrvia, etc. & BT/CT Series – M J C Alexander, 1923-28; A C Dickson, 1930: Europe, N Africa. MAT209 BU/CU Series – H Sanders, 1930: Far East. & BV/CV Series – W Vogel, 1928: Paris, Vienna. |Budapesr, Sofia, Bucarest. & BW/CW Series – A D Lawrence, 1926-30: Berlin. Scandinavia,Vienna, Budapest. Bucarest. etc. & BX/CX Series – A J Twine, 1926-30: Far East. CAT0 The Head Office (English) Catalogue. 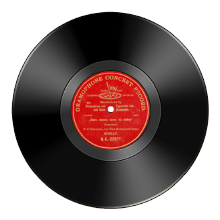 (Gramophone/Zonophone). CAT1 The Orient Catalogue (incomplete). CAT2 The Russian Catalogue (Gramophone/Zonophone/Rebikov). CAT3 The French Catalogue (electronic edition, revised and updated). CAT4 The German Catalogue (electronic edition, revised and updated). CAT5 The Italian Catalogue (electronic edsition, revised and updated). CAT7 The Central European Catalogue (includes CAT12). CAT8 The Scandinavian Catalogue (not produced – see Liliedahl). CAT9 The Dutch Catalogue (electronic version). CAT10 The Orient Zonophone Catalogue. CAT12 The Ce ntral European Catalogue (see CAT7). Pomimo ukazannykh variantov otpravki, sushchestvuet vozmozhnost kupit katalog v elektronnoi forme. Alan otpravlyaet katalog na email. Oplata na vysheukazannyi PayPal account. K osnovnomu katalogu on vysylaet eshche neskolko failov, kotorye obychno dopisyvaet na SD v kachestve dopolnitelnykh materialov. Alan Kelli tolko chto prislal mne obnovlennyi spisok katalogov, kotoryi ya pomestil v "opisanie".